The Ashley Furniture Timberline Two Drawer Night Stand brings a sense of earthiness and warmth into space. The richness and character of a replicated timber grain is enhanced with antiqued faux metal scrolling for an organic element. Two smooth-gliding drawers of varied size makes a bedroom essential. Dimensions: 23.25" x 15.75" x 25.75"
The Timberline Two Drawer Night Stand Warm Brown has many exciting features for users of all types. 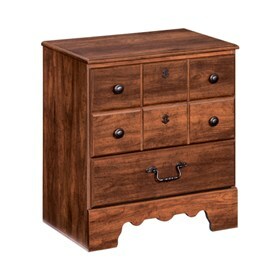 See the Timberline Two Drawer Night Stand Warm Brown gallery images above for more product views. The Timberline Two Drawer Night Stand Warm Brown is sold as a Brand New Unopened Item.